You will be on the water in no time! 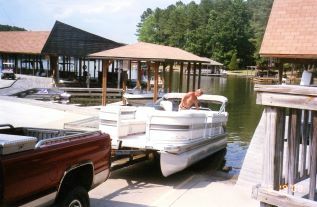 If you are staying with us just put your boat in the water from our paved ramp (no launch fee) and go. We have Ethanol Free gas and oil right here at the Stonehouse Marina. There's no need to drag the boat out of the water every evening. We have a slip in the boathouse for you to dock it. Stonehouse Timber Lodge is situated in the root of a secluded cove that offers protection from the wake and wind while allowing direct access to the main lake. At Stonehouse Timber Lodge your boat will be as convenient as your car. Get in. Go fishing, skiing or just cruise Lake Gaston. When you get back, dock it and tie it up. No hassle! She'll be good to go the next time you need her. No boat? No problem! Stonehouse Timber Lodge has pontoon boats, fishing boats and canoes to rent. What could be more convenient? You must have a valid drivers license and be 27 years of age or 21 - 27 with boating certificate. We require a credit card or $200 cash deposit. Life preservers are furnished. Fishing and Hunting License available right here at Stonehouse Timber Lodge. You can also register your boat or renew existing registration. Our Tackle Shop is stocked with live bait (minnows and night crawlers) and all the tackle, lures, baits, jigs, floats, sinkers...well, just name it and we probably have it. Give it a look!